We decided to reimagine Rosin for the home user, and are proud to have created an entirely new and unique press with the Easy Swing v2. Now, you can tilt the Easy Swing on its side, allowing your freshly-pressed rosin to drip away from the heating plates, preserving delicate aromas! Coupled with an improved heating plate, we doubled the strength of the compression springs to create an affordable, half-ton Rosin powerhouse. Dual Heated Plated all in one Controller. Dimensions: 11" w x 14" d x 20" h (up to 26"). Heating Plates: 3.5" x 3.5" Polished Aluminum, Dual Heat. Mechanism: Manually operated locking lever design. Electrical: 110/120VAC, 60Hz, 800w, 7A. 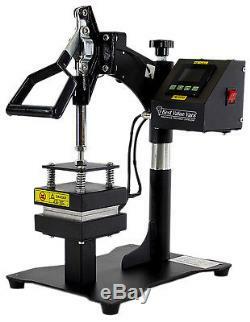 Contains: Easy Swing V2 Rosin Press, User Manual, Power Cord. Carefully read all warnings and instructions, and inspect the unit for damage prior to use. Do not use if the unit appears damaged, bent, warped, cracked, or otherwise unsafe for operation. Do not open or modify electrical equipment. Keep hands clear of the pressing plates. Warning: Plates May be hot! 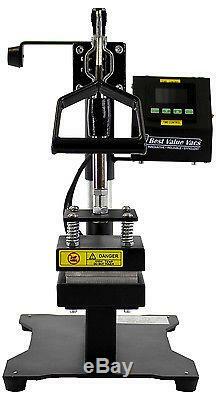 The item "Rosin Press Easy Swing V2, 1000PSI, Half Ton, Dual Heated Plates" is in sale since Friday, January 26, 2018. This item is in the category "Business & Industrial\Printing & Graphic Arts\Screen & Specialty Printing\Heat Transfer\Presses". The seller is "marosidesignllc" and is located in Naperville, Illinois. This item can be shipped to United States.